Continuing its campaign of "Hey, we used to be mediocre, and now we taste good because we changed everything!" that started with new crust and hit its stride with deep-dish pies, Domino's has now turned its re-branding lens on pizza's favorite complement: beer chicken. 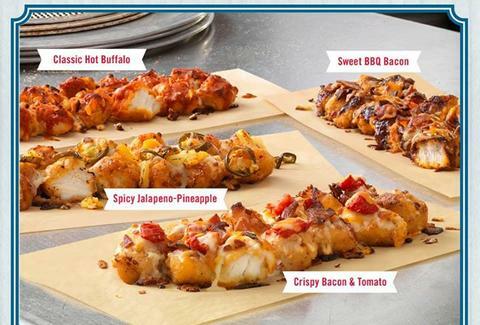 The pizza chain just announced a line of "Specialty Chicken" which includes such illustrious picks as Classic Hot Buffalo, Sweet BBQ Bacon, Spicy Jalapeno-Pineapple, and Crispy Bacon and Tomato, just in case there wasn't enough bacon. And while adding bacon to anything usually means an increase in quality, these suckers are made of 100% white meat, and run a mere $5.99 per box, so you can get a product of increased quality for the same price you fell in love with at midnight every Friday in college. Kristin Hunt is a food/drink staff writer for Thrillist, and has always been better at gin rummy than dominoes. Follow her to pizza-fueled matches at @kristin_hunt.